Take a Look! October 2017 - Welcoming Friends to Our Annual Workshop in New York! The unfolding tragic disasters over the last months -- hurricanes, fires, floods, political turmoil, refugee crises, mass shootings -- have left us speechless. We struggle to find enough healing words and actions that will offer courage and comfort to all who are impacted by these heartbreaking developments. Holding hands in solidarity, may all of us find dignifying ways to do whatever we can to support those living through these crises. To add strength to your courage , please allow us to share with you Evelin Lindner's Invitation to a Future that Dignifies People and the Planet: New Definitions of Heroism. Our work together is more important than ever! In this edition of Take a Look, we wish to welcome everyone to our upcoming 14th Annual Workshop on Transforming Humiliation and Violent Conflict in New York, December 7th - 8th, and to our future Dignity Conferences, in Egypt in 2018 and Brazil in 2019. Thank you for connecting with us in our efforts to create a world of dignity for all! 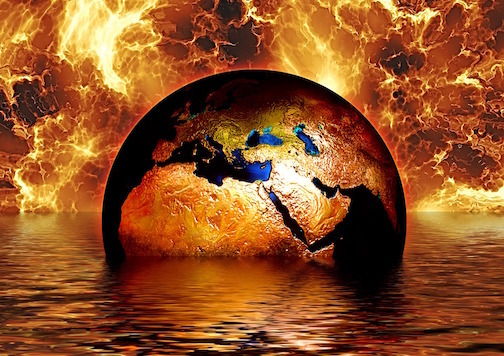 The dramatic and dangerous consequences of climate change -- hurricanes, floods, fires, displaced refugees, political conflict sparking violence -- inspired our workshop theme this year. 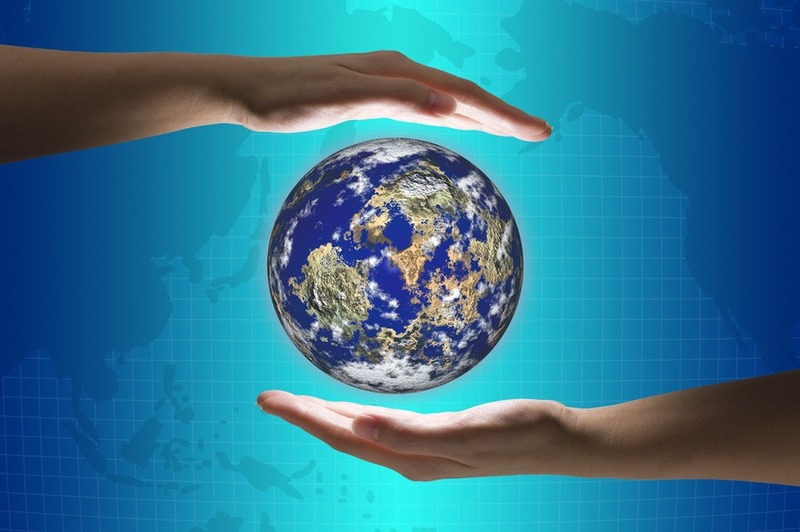 We invite everyone to consider how practicing mutual dignity not only protects and replenishes our human relationships, it protects our planet, especially in times of crisis. Registration begins at 9:00 AM; and the workshop begins at 10:00 AM in Everett Lounge, Teachers College. You will find all of the latest details about the workshop -- updated regularly -- at: http://www.humiliationstudies.org/whoweare/annualmeeting/30.php . 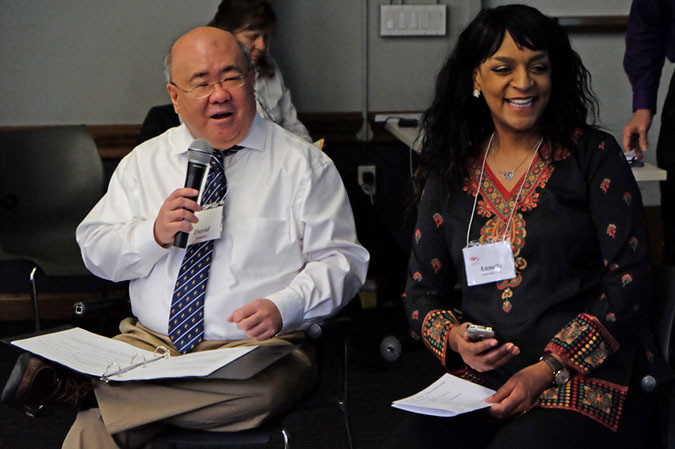 Our conferences and workshops are designed to widen space for collaboration, conversation, and mutually energizing connections. We strive to move beyond the conventional lecture/presentation format to meet in a spirit of shared humility and equal dignity. In addition to our preplanned Dignilogue Sessions ( Dignilogue = Dignity + Dialogue), our afternoons will be action-oriented and organized around Co-Created Dignilogue Groups. These groups will focus on topics of interest proposed by YOU. Rather than planning a "presentation," we encourage you to come as you are and enjoy the mutual learning experience of engaging in -- or even facilitating -- authentic, creative conversations that lead to new ideas and new opportunities for action. 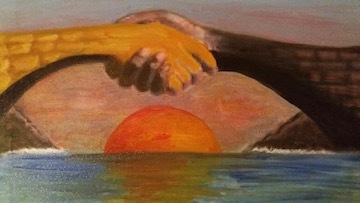 Please join us in thanking Phil Brown for leading us as we organize our Co-Created Dignilogues. The grand finale of each afternoon will be inviting representatives from each Co-Created Dignilogue Group to make a Dignivideo, a "message to the world," in which they share their group's insights on what the world needs to heed if we want to create a dignified future. For example, please see the wonderful videos from our 2017 Dignity Conference in India. These videos will be treasured contributions to our World Dignity University initiative , inspiring future generations of our community. For those of you who would still like to join us and have not yet registered, please kindly send a message to: workshops@humiliationstudies.org. We would be delighted to hear from you by November 24th or sooner. Again, we are very much looking forward to seeing you at the workshop! An Explosive Mix -- And How We Can Defuse It with Dignity ! Evelin Lindner, MD, Ph.D., Ph.D.
"Evelin Lindner is one of the most important, present-day actors for peace, international solidarity and conflict resolution, human rights and democracy building, and in this book she addresses the most burning issues of our time -- terrorism and the quest for a dignified world. " -- Inga Bostad, Professor of Philosophy, Director, Norwegian Centre for Human Rights, University of Oslo, Norway. We look forward to having you with us at our Public Event to celebrate the publication of Evelin Lindner's monumental new book! Please join us in recognizing and thanking our Team of Careholders and Dignigardeners who make this program possible! Careholders oversee crucial components of the workshop, including welcoming and registration, meeting/greeting, videography/photography, music/movement, moderating/facilitating, and timekeeping. 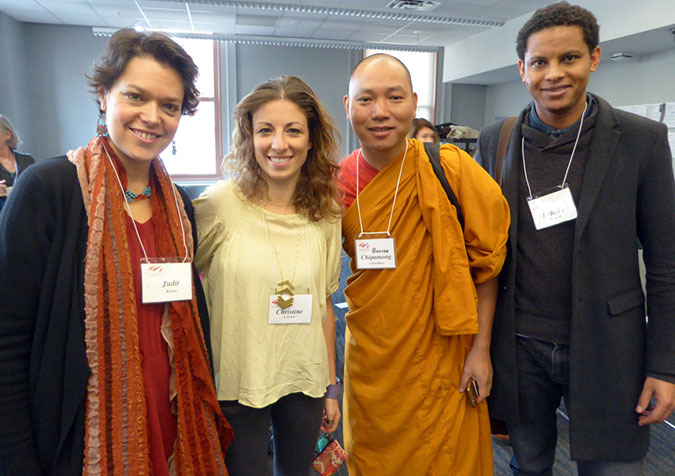 Their efforts nurture the unique relational climate that encourages rich, empathic, and energized engagement. Dignigardners play an important role encouraging, supporting, and recognizing dignifying dialogue throughout the workshop. We are delighted to welcome these skillful friends to support everyone in their efforts to create the relational space that generates thoughtful connection and constructive collaboration. We have a wealth of creative talent in our HumanDHS community. This has inspired us to "keep art close to our hearts" during our workshops. In particular, we welcome returning friends to share their creative talents by bringing us together and organizing transitions between workshop activities. Please kindly remember to thank them for their generous contributions! This event is hosted by HumanDHS and the Morton Deutsch International Center for Cooperation and Conflict Resolution (MD-ICCCR), in cooperation with the World Dignity University initiative. We are deeply grateful to all of our colleagues and friends at MD-ICCCR. The workshop will always be a tribute to our forever Honorary Convener, the late Morton Deutsch. P.S. We encourage you to print and retain this reminder to help you with your travel plans. Please bring your picture ID and a copy of your invitation or program, so you can show it at the entrance of Teachers College. An Ecolinguistics Poster for YOU! Francisco Gomes de Matos, member of our HumanDHS Global Advisory Board, for sharing this beautiful poster with our dignicommunity! The poster comes from Francisco's forthcoming e-book Rhymed Reflections. 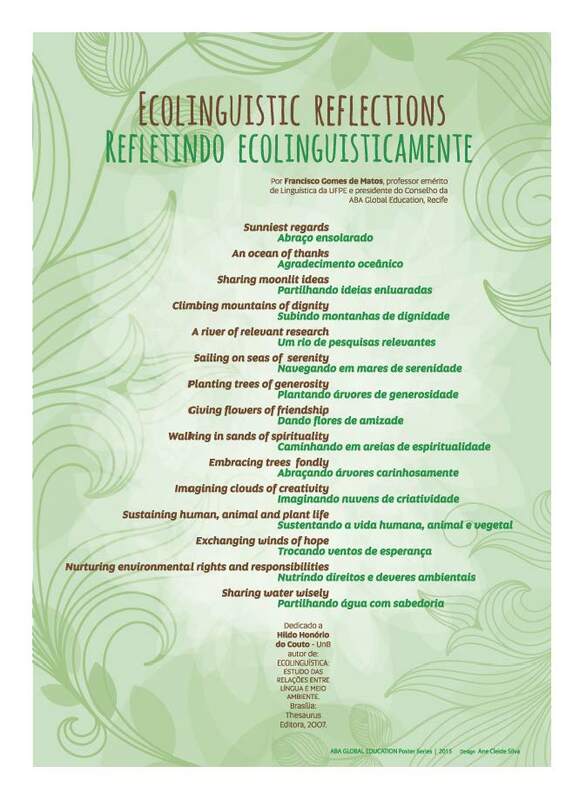 A Forest of Ideas/Ideals, to be published by ABA Global Education, Recife, Brazil. Celebrating Our Indore Friends and Participants! 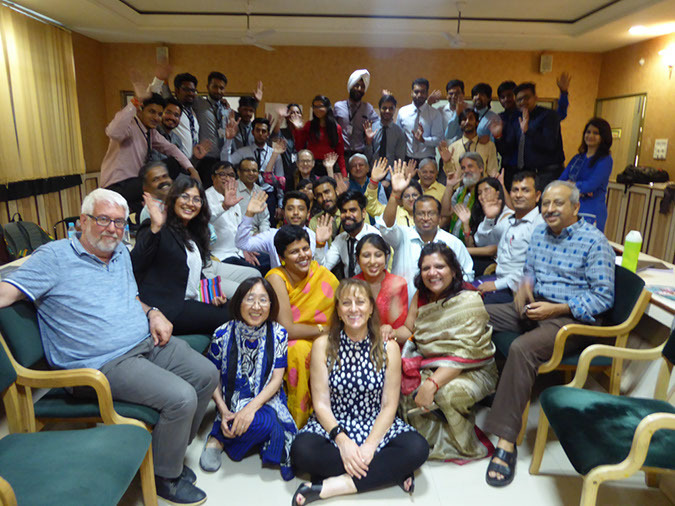 We had a remarkable dignity conference in Indore, India! There are not enough words to express our appreciation, recognition, and deep gratitude to all those who made this conference possible! Everyone participated by not only offering their particular personal perspectives, everyone also engaged in an enormously enriching process of co-creating new horizons of meaning for ourselves and for our societies, including world society. We invite you to visit the conference website to see the program, papers, pictures, and videos that tell the story of this richly diverse and remarkable event! Please allow us to express our profound gratitude to the esteemed inspirer of this conference, our dear Deepak Tripathi, and to our gracious host, the Renaissance University, with Swapnil Kothari as Founder and Chairman of the Indore-Indira Group, and Sarabjeet Singh Bharaj as CEO and director of the Indore-Indira Group. Our conference was honored to be the very first event of the newly accredited Renaissance University. Our gratitude also goes to the wonderful team around Amol Mishra, with Vinita Raj, Menika Soni Jadon, Pooja Upadhaya Vyas, Rachana Ghadge, and many others, together with the great principal of the Renaissance College, Dr. Rajesh Dixit, with his distinguished faculty. We are so proud that we were able to honor and celebrate our host teams with our Beacon of Dignity Award! We did this during our Public Event on August 19th! And we would also like to express our warmest gratitude to Suraj Pillai and Amit Singh for being with us untiringly, recording videos, taking photos, and making sure that our IT systems worked! We particularly wish to acknowledge Avi Shahaf, who so wonderfully took the responsibility of coordinating our Dignilogues! Warmest Congratulations to Everyone for Co-Creating a Remarkable Conference! Congratulations to the 2017 Nobel Peace Prize Recipients! We warmly congratulate the International Campaign to Abolish Nuclear Weapons (ICAN) for receiving the 2017 Nobel Peace Prize for their crucially important work! We are also very thankful that our global dignity work was nominated again this year, as in 2015 and 2016. We were nominated by a group of people who, out of appreciation for the prize, wishes to refresh awareness of its roots. 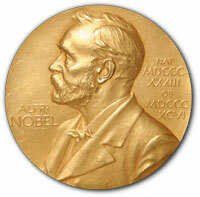 We are celebrating all the remarkable individuals and groups nominated for their extraordinary efforts (2015, 2016, 2017), in particular, those whose work resonates with the will of Alfred Nobel and his inspirer Bertha von Suttner (see also her 1889 book, Die Waffen nieder! or Lay Down Your Arms!). Dignity Press (DP) has been going through many changes. It is making a transition toward a new, open source software and moving in the direction of creating ePublications. 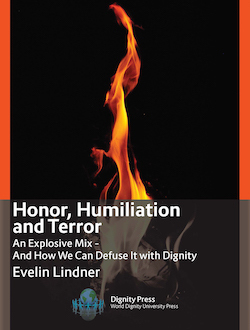 With the publication of Evelin's monumental book, Honor, Humiliation, and Terror, DP is striving to chart a path that makes the knowledge we build as a community affordable and available to all!